Address: Village: Khadukhali Tekaparara, Ward No- 9, Chhonua Union, Banshkhali Upazila, Chittagong District, Bangladesh. Md. Mohiuddin, the third children of his parents, is disable by birth. Their family of 10 members is living under extreme poverty. Mohiuddin’s parents are unable to bear cost of his education. However, Mohiuddin is determined to complete his studies. Despite having physical challenges and living under poverty, Mohiuddin has a strong willpower and determination to become self-reliant; he is wishing to complete his studies and work to earn. Instead of being, a burden to his family Mohiddin is wishing to help them. He dreams for a life like a complete man around him. In June 2016 Muslim Aid – UK Bangladesh field office has given him unconditional financial grant of BDT 4,000 under ECHO funded “Early Recovery support to Tropical Storm Roanu affected people in Chittagong, Cox's Bazar and Bhola Districts of Bangladesh” project. Mohiuddin paid his dues fees to the college to continue his studies and brought necessary books for him. Again on 29th December, 2016 he received BDT 4000. He paid admission fees by the grant of HSC exam. 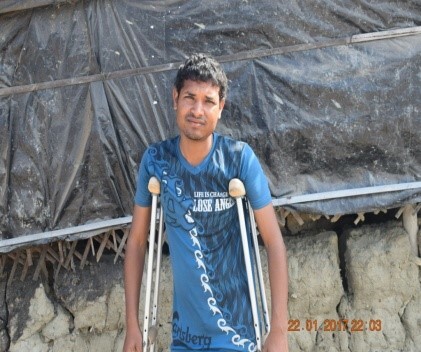 Mohiuddin’s hardwork and determination is helping him to unleash barriers of physical disabilities and helplessness of poverty. He is moving forward for a life he is dreaming of.